A ticket with five numbers, but missing the Mega number, in Tuesday's drawing of the multi-state Mega Millions lottery was sold at an ampm mini-market in Poway and is worth $802,153. 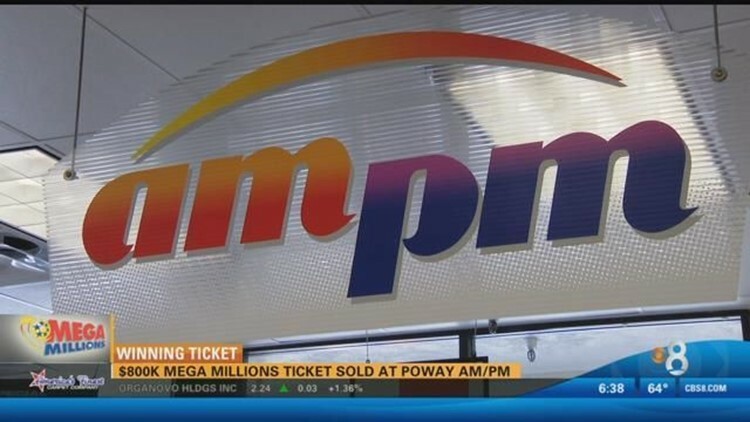 POWAY (CNS) - A ticket with five numbers, but missing the Mega number, in Tuesday's drawing of the multi-state Mega Millions lottery was sold at an ampm mini-market in Poway and is worth $802,153. There were three other tickets sold with five numbers, but missing the Mega number, one each in Florida, Illinois and South Carolina. Megaplier winner, an option not available in California. California law requires major payoffs of lottery games to be paid on a pari-mutuel basis. There were no tickets sold with all six numbers in tonight's drawing and the estimated jackpot for Friday's drawing will grow to $144 million. The numbers drawn tonight were 1, 29, 33, 34, 55 and the Mega number was 6. The estimated jackpot was $135 million. The drawing was the 15th since the last time a ticket with all six numbers was sold. The Mega Millions game is played in 44 states, the District of Columbia and U.S. Virgin Islands.